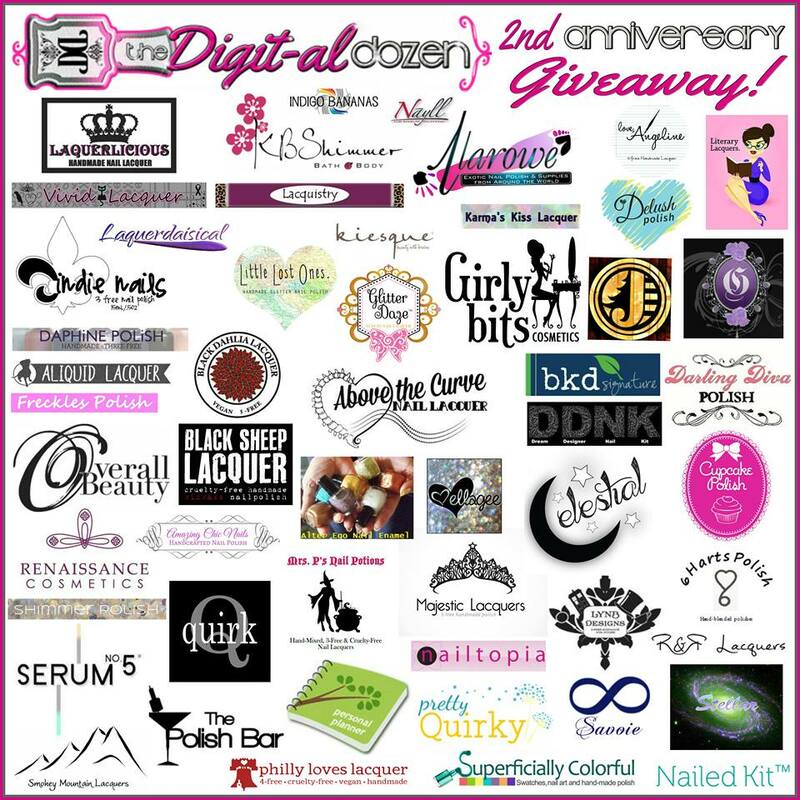 The Digital Dozen does a giveaway! It’s been 2 years since the Digit-al Dozen first got together, and although we’ve had a few different line-ups in that time, one thing has remained constant - our love of nail polish and nail art. To celebrate, we are holding a legendary Giveaway featuring 51 prizes. To all our brilliant sponsors,we can’t thank you enough for helping us set this up for you, our amazing readers. · Laquerlicious Nail Polish - 3 neon toppers. Beat The Heat, At The Lake and Lemon Limeade. · Nayll – 4 bottles of custom made polishes – you get to make your own! That’s an enormous list, isn’t it!! How exciting – ok, so you know what you need to do, enter the rafflecopter and we’ll let you know on September 25th(or thereabouts) if you’re a winner. The Giveaway will close at 11.59pm GMT on Tuesday September 24th. If you are a winner, we will let you know which prize you have won, and then we will then put you in touch with your sponsor to claim / choose your prize (some sponsors have provided specific prizes; some will let you choose your own polishes).